i followed the directions, but everyone else didnt. I see politics in your future! I disagree with this comment^. Like if you do too! Guys, this kid is a genius. Who calls them math boxes? They're crocodile mouths! 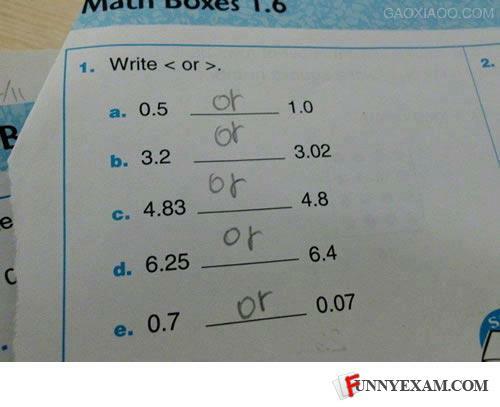 Wrong, It's "" not "or"
The answers are < or >. Should've put < or > for every problem and said "this is math?" the answer should be < or >. Technically, he didn't follow directions because he wrote "or" when he should have written "< or >" in all the blanks. THEN he would have been correct. Nope. The answer for all of them is .